Operation Chastise, the plan to destroy the mighty Ruhr dams, was bold, audacious and dangerous. It was also set to become one of the most legendary combat missions ever undertaken in the history of aviation warfare. In late February 1943 a unique decision was taken by the RAF to form the now legendary 617 Squadron, a highly specialised unit within Bomber Command. Its task was to be the destruction of the huge Möhne, Sorpe and Eder dams, which provided vital services to German industry. Tasked with providing the crews for this new squadron was the young, outstanding, bomber and night-fighter pilot Wing Commander Guy Gibson, already a veteran of 174 bomber operations. On 21 March 1943 the unit was formed at RAF Scampton under his command, and the chosen men had just eight weeks to prepare for the task in hand. 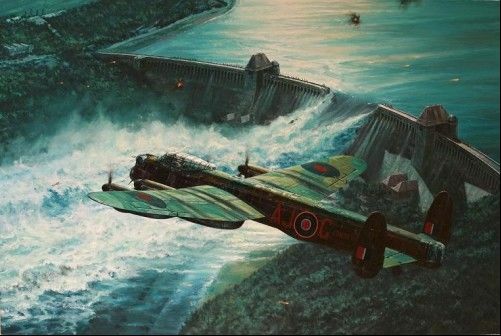 Anthony Saunders’ powerful painting portrays Guy Gibson under fire from the defending garrison as he powers his Lancaster AJ-G at full throttle over the dam to confirm the extent of the successful breach. Below him, and clearly visible, the bright moonlight reveals the huge rupture in the dam’s massive wall as the swirling avalanche of water surges into the valley below. With the subsequent destruction of the Eder Dam, and the damage to the Sorpe Dam, the men of 617 Squadron had achieved what they were asked, and more. Each print is personally autographed by veterans who played a vital part in this legendary raid. Duty R/T operator on the night of the raid it was she who talked home the surviving crews. Specialist ground crew for 617 Sqn he was heavily involved in carrying out the modifications before the raid.